Back in December last year I was involved in a road traffic incident. I was the guilty party making an error of judgement that could quite easily have resulted in me and possible others being injured or even killed. 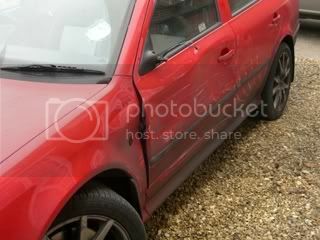 Thankfully no one was and the incident just resulted in some damage to my car and another vehicle. At the time I put my hands up immediately and admitted being an idiot. The police attended and after their investigation told me, not unsurprisingly, that there was sufficient evidence for me to be prosecuted for Driving without due care and attention (“careless driving”) contrary to Section 3 of the Road Traffic Act 1988. The officer attending told me that in the past such incidents when referred to the Crown Prosecution Service automatically resulted in a fine and penalty points on the driving licence following successful prosecution. However for several years rather than clogging up the court systems with this punitive course of action a driver improvement course has been offered as an alternative, the aim being to educate drivers in the art of advanced or defensive driving so that they changed their attitude and improved their skills and road craft so they are then less likely to cause similar incidents in the future. By agreeing to attend and successfully completing the course a driver could avoid being prosecuted. The courses aren’t free they cost the best part of £200 but it is substantially cheaper than the alternative. So that was that! I went home got the car repaired under my insurance and waited. 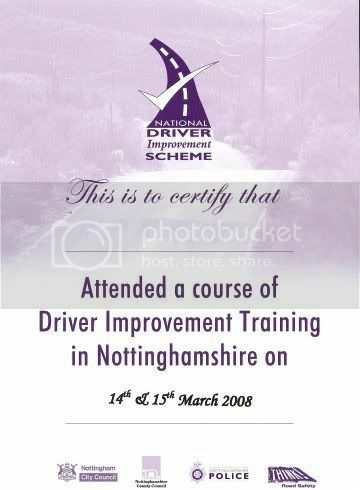 At the end of January I received a letter inviting me to attend a session of the “Driver Improvement Scheme” held by Nottingham City Council in conjunction with a number of other public bodies. For the last two days I have attended one of the courses, along with 13 other people of all ages and backgrounds, in the centre of Nottingham. The course consisted of one full day and one half day. The first part consisted of theory of what makes a good driver and attitude and it’s effects on driving. There were exercises in the art of hazard recognition and crash investigation in which real-life fatal incidents were played out using models and you could see how seemingly innocuous actions could have catastrophic effects to the outcome and with a little thought by certain parties death could have been avoided. After lunch on the first day we were allocated to advanced driving instructors and taken out for assessment and then instruction to correct our faults and educate us in the art of defensive driving. I scored very highly in this and my main failings were a tendency to creep over the speed limit as I went along with the flow and not maintaining a safe distance in town traffic, I also didn’t negotiate speed humps smoothly. Today was the second day of the course and involved a test on the highway code, instruction on defensive motorway driving and a final assessment. The idea being that on this final part you showed significant improvement compared to the previous day. Before we started the second session of driving we were given the results of our initial assessment and I was pleased as punch by the comments on mine! I am pleased to say I passed and can say I have learned an awful lot, it was very friendly, relaxed and informative and well worth attending not just because it meant escaping prosecution. Following this I am serious considering taking one of the advanced driving tests offered by RoSPA or the Institute of Advanced Motoring.